” Culturally-appropriate care and safety has a vast role to play in improving the health and wellbeing of our people. In this respect, I want to make special mention of the proven record of the Aboriginal Community Health Organisations in increasing the health and wellbeing of First Peoples by delivering culturally competent care. In Noongar language I say, kaya wangju. I acknowledge the traditional custodians on the land on which we meet and join together in acknowledging this fellowship and sharing of ideas. I acknowledge Elders, past and present and I also want to acknowledge some individuals who have done an outstanding job in the work that you all do and I thank you for the impact that you have at the local community level: John Singer, chair of NACCHO; Pat Turner AM, CEO of NACCHO; Donnella Mills; Dr Dawn Casey; Dr Fadwa Al-Yaman; Professor Sandra Eades; Donna Ah Chee; LaVerne Bellear; Chris Bin Kali; Adrian Carson – and I’m sorry to hear that Adrian’s not with us because of a family loss – Kieran Chilcott; Raylene Foster; Rod Jackson; Vicki Holmes; John Mitchell; Scott Monaghan; Lesley Nelson; Julie Tongs; Olga Havnen. All of you I have known over a long period of time and the work and commitment that you have made to the pathways that you have taken has been outstanding. I’d also like to acknowledge Dr Tim Howle, Prajali Dangol, and Helen Johnstone, the report authors. I’m pleased to be here at this conference, which aims to make a difference with a simple but sentinel theme of investing in what works, surely a guiding principle for all that we do. Providing strong pointers for this is a new report from the Australian Institute of Health and Welfare. I understand this is the very first study by the Institute that focuses solely on First Nations people aged 10 to 24. As such, it is a critical document. Firstly because it puts at your fingertips high quality, targeted research about our young people. Secondly, it gives us a clear understanding of where they are doing well, but also the challenges young people still face. And thirdly, equipped with this information, we can connect the dots – what is working well and where we need to focus our energies, invest our expertise, so our young people can reap the benefits of better health and wellbeing. I’m always passionate about all young people having the best start in life and marshalling the human resources necessary so that this care extends right through to early adulthood, laying strong foundations for the rest of their lives. I want to run through some of the key findings of this report and then talk about Closing the Gap Refresh in our Government’s commitment to and support for our young people. I’m pleased some real positives have been identified. The report found a majority of the 242,000 young First Australians, or 63 per cent, assessed their health as either excellent or very good. Further, 61 per cent of young people had a connection to country and 69 per cent were involved in cultural events in the previous 12 months. As the oldest continuous culture, we know that maintaining our connections to country and our cultural traditions is a key to our health and wellbeing. Education is another important factor in our ability to live well and reach our full potential. In the 20 to 24 age group, the number of young people who have completed Year 12 or the equivalent has increased from 47 per cent in 2006 to 65 per cent in 2016. Smoking rates have declined and there is also an increase in the number of young people who have never taken up smoking in the first place. Eighty-three per cent of respondents reported they had access to a GP and between 2010 and 2016, the proportion of young people aged 15 to 24 who had an Indigenous health check – that’s the MBS Item 715 – almost quadrupled from 6 per cent to 22 per cent. These are some of the encouraging results, but challenges remain. In 2016, 42 per cent of young First Australians were not engaged in education, employment or training. Although there has been a decline in smoking rates for young people, one in three aged between 15 and 24 was still smoking daily. Sixty-two per cent of our young people aged 10 to 24 had a longer-term health challenge such as respiratory disease, eye and vision problems, or mental health conditions. These statistics inform us, and, critically in the work we are doing, point to an evidence-based pathway forward. I know you’ll be interested to know that the Prime Minister has now confirmed the refresh of the Closing the Gap will be considered at the next COAG meeting on 12 December. Closing the Gap requires us to raise our sights from a focus on problems and deficits to actively supporting the full participation of Aboriginal and Torres Strait Islander people in the social and economic life of the nation. There is a need to focus on the long term and on future generations to strengthen prevention and early intervention initiatives that help build strong families and communities. The Government has hosted 29 national roundtables from November 2017 to August 2018 in each state and territory capital city and major regional centres. We’ve also met with a significant number of stakeholders. In total, we reached more than 1200 participants. More than 170 written submissions were also received on the public discussion paper about Refresh. The Refresh is expected to settle on 10 to 15 targets. These targets are aimed at building our strengths and successes to support intergenerational change. Existing targets on life expectancy, Year 12 enrolment, and early childhood will continue. Action plans will set out the concrete steps each government will take to achieve the new Closing the Gap targets, and we have to hold state and territory governments to account. The plans to be developed in the first half of 2019 will be informed by the lived experience of Aboriginal and Torres Strait Islander people, community leaders, service providers, and peak bodies. Dedicated and continuous dialogue along with meaningful engagement with Aboriginal and Torres Strait Islander people and communities is fundamental to ensuring the refreshed agenda and revised targets meets the expectations and aspirations of First Australians and the nation as a whole. These actions will be backed by positive policy changes in both prevention and treatment, such as the introduction from tomorrow of the new Medicare Benefits Schedule item to fund delivery of remote kidney dialysis by nurses and Aboriginal and Torres Strait Islander health workers and practitioners, further improving access to dialysis on country. The COAG health ministers in Alice Springs just recently on 3 August met with Indigenous leaders and asked for their views on a range of issues, and all of the leaders in attendance had an incredible impact on each state and territory Minister. I know that because I attended the Ministers’ dinner later in which the discussion came to the very issues that were raised by our leaders from all over the nation. And COAG, the next morning, made the decision that Aboriginal health will be a priority on the COAG agenda for all future meetings, and that whoever the Minister for Indigenous Health is will be ex officio on the Health Ministers’ Forum to inform and to engage in a dialogue around the key issues that were identified, not only by the leadership, but by the evidence of the work that we do; and there are six national priorities now that COAG will turn its mind to, the COAG health ministers. Over the next decade, the Australian Government has committed $10 billion to improve the health of First Australians. This is a substantial sum of money, but we are only going to achieve better health and wellbeing outcomes if we work and walk together. We have to build mutual trust and respect in all that we do, and I include in this every state and territory system. We have to increase cultural capability and responsibility in all health settings and services. We must support and encourage the development of local and family-based approaches for health. As I’ve said before, we need every one of our men and women to take the lead and perpetuate our proud traditions that have kept us healthy for 65,000 years. Culturally-appropriate care and safety has a vast role to play in improving the health and wellbeing of our people. In this respect, I want to make special mention of the proven record of the Aboriginal Community Health Organisations in increasing the health and wellbeing of First Peoples by delivering culturally competent care. And while they’re widely canvassing the importance of supporting the growth and potential of children and young adults, I would like to make special mention of the support required for our senior people as well, our Elders. We must ensure that all older First Nations Australians who are eligible for age or disability support can access the care they deserve; either through the My Aged Care System or the National Disability Insurance Scheme. 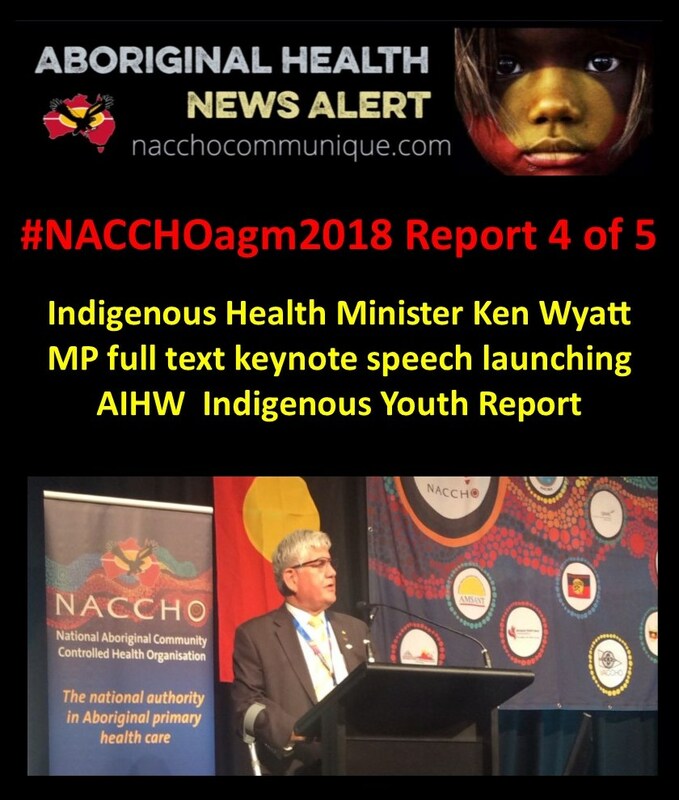 With a holistic grassroots approach of the Aboriginal Community Controlled Health Organisations, I believe ACCHOs should work to ensure that our older, Indigenous leaders receive assessments and support options that are available. In August, as I indicated, I met with Indigenous leaders as part of the COAG Health Council Roundtable. Coming out of this was not only a resolution to make First Peoples health a continuing council priority, but a commitment to develop a National Aboriginal and Torres Strait Islander Health and Medical Workforce plan. I see this as being more about Aboriginal doctors, nurses and health workers working on country and in our towns and cities. It’s also about building capacity of health professionals across the entire health system to provide culturally safe services. I was talking with Shelly Strickland some time ago, and she asked me a couple of questions, and I said to her: watch the movie Hidden Figures. And at the time, I know she left me thinking what the hell is he talking about and why would you recommend a movie? When you look at that movie, it was about Afro-American women who put man on the moon. The movie is based on the work of the women who gave the scientists the solutions to putting a rocket into space, landing man on the moon, and bringing them back; it was an untold story. And there are multiple layers when you look at that movie of overt racism. They were not allowed to use the same toilets as their white counterparts, they had to run two car parks away in any condition to use a toilet. When something went wrong, people looked at them and saw them as the fault. But what they did very superbly was take their knowledge, apply science, apply the thinking that was needed, and demonstrated mathematically that man could land on the moon. Not one NASA, non-Indigenous or non-American Afro-American had reached that solution. Those four women – I think it was four – provided the solution, but their story was never told. And they were the true leaders of space adventure and discovery. If they had not done the thinking and the tackling of the issue, then the solution would never have been reached. There are parallels in Aboriginal health. We think of GP super clinics – they were modelled on our AMSs, about a holistic approach. There are other elements of what you do, and what we as a people do, that health systems have taken note of. But what we have to be better at is sharing where we have leadership. I look at the work that Donna Murray is doing with Allied Health Staff – the outcomes that she achieves, they are stunning. The work which she puts into helping make the journey a positive journey achieves outcomes that are disproportional to the work that we do as a government in many other areas in mainstream. And we do lead – and if you haven’t seen that movie, you have to look at it and think of the parallels that our people went through. But, I think the other most salient point is, is that it was the Afro-American women who were the backbone of the space and science discovery program of America. And I would like to acknowledge our women as well. I think the NAIDOC theme is one of the best themes I have seen in a long time; and I’ve been around a while. And I see it in health where our women play a very pivotal role and are the backbone of the frontline services that are delivered. Men always gravitate to the top; we tend to do that. But, I do see that the actual hands-on work is done by our women, and so I thank you for that, because the progress we’ve made is because of the way in which you, like those Afro-American women, have helped shape the destiny and future. And I think of some of the people that I’ve known over the years who would be in a similar category. And certainly, I’ll single out one because she was a great friend and taught me a lot, was Naomi Myers, whose leadership and dedication was parallel to that of the women in that movie Hidden Figures. While the Medical Health Workforce Plan will be positive for Aboriginal Torres Islander jobs across Australia, it has particular potential for tackling chronic disease and improving the lives of our people in remote communities. We are all well aware of the importance of health and wellbeing of our young children. There is ample evidence that investment in child and family health supports the health and development of children in the first five years; setting strong foundations for life. And Kerry Arabena’s work certainly epitomises that along with many others. Good health and learning behaviours set in the early years continue throughout a young person’s life. Young people are more likely to remain engaged in education and make healthy choices when they’re happy, healthy and resilient, and supported by strong families and communities that have access to services and support their needs. Connected Beginnings program is using a collective impact placed based approach to prepare children for the transition to school so they are able to learn and thrive. The program is providing children and their families with access to cohesive and coordinated support and services in their communities. The Australian Nurse Family Partnership Program targets mothers from early pregnancy through to the child’s second birthday, and aims to improve pregnancy outcomes by helping women engage in good preventive health practices, supporting parents to improve their child’s health and development, and helping parents develop a vision for their own child’s future; including continuing education and work. Increasingly, research is also highlighting the long term value of investing in youth. This investment benefits young people now as they become adults, and as they then have children of their own. So I want to focus on some of the things that we are doing that is important, the take up of MBS 175, access to MBS items. We’re improving the Practice Incentives Program, Indigenous Health Incentive which promotes best practice and culturally safe chronic disease care. We are reducing preventable chronic disease caused by poor nutrition through the EON Thriving Community programs in remote communities. We’re tackling smoking rates through the Tackling Indigenous Smoking Program; and encouragingly, youth had the biggest drop. And we’re prioritising Aboriginal and Torres Strait Islander mental health in the first round of funding under the Million Minds Research Mission. More broadly, for our First Australians and the wider population, we are investing in services for the one in four who experience mental illness each year. And this also includes through Minister Hunt funding to headspace Centres, Orygen, beyondblue’s new school-based initiative BU, Digital Mental Health child, and youth mental health research and working alongside Greg has been a tremendous opportunity, because I’ve been able to get into his ear about the need for him also to consider our people in key initiatives that he launches, and he’s been a great ally. And our work on the 10-year National Action Plan for Children’s Health continues. I want to continue setting strong foundations for making sure our people have access to culturally safe and appropriate health services. Let me also just go quickly to the report. I had a look at the report online, and I was impressed with the way in which the writers – and FAD were in AIHW and have pulled together this one and have taken elements out of the two major better health reports. And it was great to see our profiling, in some cases being better, in some cases being challenging. 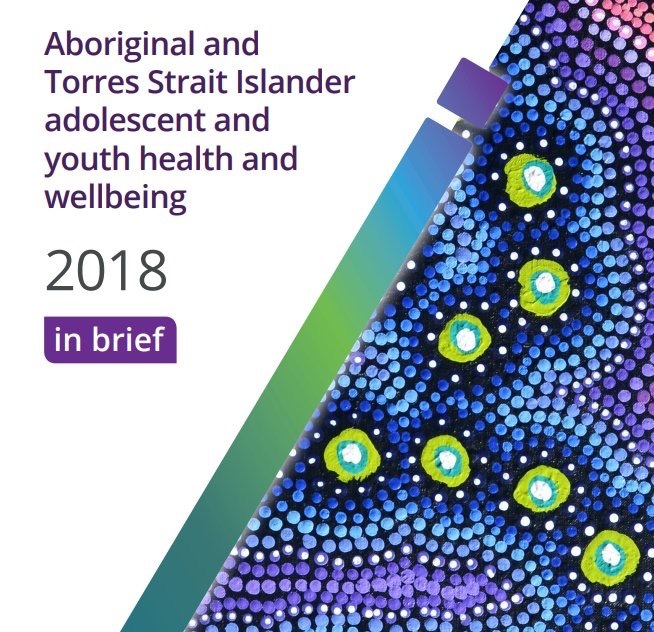 But this is a good guide for all of us to use and I commend everybody who’s been involved, and it gives me great pleasure to launch the Aboriginal and Torres Strait Islander Adolescent and Youth Health and Wellbeing 2018 report. So, congratulations to all of those involved and congratulations to each and every one of you who have contributed to this report in the data that you provide, the work that you do but your commitment to our people. Thank you.